The apprx. 22 Km. tour starts in the morning. 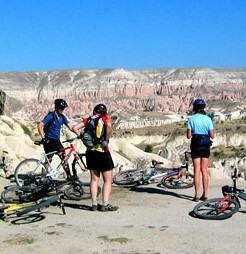 Covering Uzengi, Ortahisar and Vineyards to get the feeling of cycling in Cappadocia and to get used to the bikes. Lunch in Mustafapasa village which was an old Greek settlement until 1920's. After lunch a short visit to the village and than a half day Red Valley hike (apprx. 5 Km.) 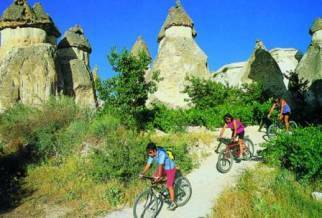 covering one of the most attractive valleys of Cappadocia. The tour will end in Cavusin, and then we will ride back to the hotel. * The tour includes, pick-up and drop-off from the hotels, lunch, bikes and services of an english speaking guide throughout.